With less than a fortnight to go until San Marino's national side travel to Slovenia to take on their Euro 2016 opponents in Ljubljana, preparations have been thrown into disarray by the country's recently-formed players union (L'Associazione Sammarinese Calciatori or ASC) taking the decision on 13/3/15 to go on strike. ASC president Luca Bollini told San Marino RTV that the decision to strike had not been an easy one to take, but was "necessary" and had been taken following the lack of a response to a series of proposals delivered to the FSGC (San Marino FA) last September. Said proposals concerned areas such as the national team, women's football in the country, Futsal, the coaching of children, the implementation of a proper physiotherapy system, the appointment of a team manager, and the national championship. A letter was apparently forwarded to the FSGC complaining of "a lack of dialogue with the [FSGC] in the person of the General Secretary (Luciano Casadei)." Bollini added that the ASC had consistently sought dialogue with the FSGC, and had sought a response from the San Marino FA's board with regard to the projects they had proposed, but have yet to receive a response. "Since we founded the Association, we have always sought dialogue throughout the movement. We want there to be an open dialogue, the movement is growing, we are the protagonists and we have the right to be heard." A training session under national team manager Pierangelo Manzaroli is due to be held on 16/3/15, but, at the time of writing, it appears as though it will, at best, be sparsely attended. "I'm sorry to have arrived at such a point less than 20 days before such an important game," Bollini said, "but if you don't take such a position you won't get anywhere." Vice-president of the ASC and record goalscorer for La Serenissima Andy Selva went further, saying that the association "never thought we would have to go so far. But. if on one hand we are sorry, on the other we have to protect our players. We presented 7 or 8 projects [to the FSGC] but we have never been taken into account." "We presented the projects in September and we still don't know whether they are being approved or discussed. We are on strike as from yesterday (14/3/15). We expect a confrontation with the federation..and should the situation remain as it is, we will not turn up for training on Monday (16/3/15)." In an article which appeared on the website of Italian newspaper La Repubblica, Selva was reported as saying: "We want to collaborate to improve football, if our football hasn't produced a player [of quality] in the last thirty years, there has to be a reason for this. We aren't looking to dictate things, but to discuss them. We have a project which we would like to be examined by the [FSGC] board." "For example? It isn't right that a player should receive €60 for playing in a friendly in Liechtenstein [this match is due to take place in Eschen-Mauren four days after the game in Ljubljana], then have to pay taxes and take two days off work. It's trivial, but this is what happens to us." Selva also repeated the above to another news organisation, and also questioned why there wasn't a supervisory body for technical matters, and whether managers have the correct coaching qualifications. He also said that the players "are not represented on the [FSGC] board. The federation says that we must be elected by a club, but we are not able to wait a year to present a draft..We are willing to co-operate, we are a group of players willing to improve our football..We are here to discuss things, not make the rules. We hope for a meeting open to dialogue." Meanwhile, the president of San Marino's governing body, Giorgio Crescentini, reacted strongly to the strike announcement: "It's an absurd strike. If these gentlemen want to go and destroy Sammarinese football, let them. They won't go to Slovenia? Fine, we'll withdraw all our teams from international competition and UEFA will ban us from all competitions. We will not be blackmailed by anyone. "They are creating enormous damage to the image of the federation and the country at international level. These are not the ways and means to deal with any problems and I find the attitude of this [new organisation] which wants to enter the federation and start calling the shots. It is an unhappy issue, and this federation and its leaders deserve respect for what they have done over the last 25 years." Crescentini apparently confessed to Italian press agency Italpress that he had been "caught by surprise" by events as he had been away for a few days, and added that there was daily contact with ASC representatives.He also said that the allegations against FSGC secretary Casadei were "biased and untrue", but also expressed the hope that all grievances would be addressed before the team is due to leave for Slovenia. The Sammarinese Secretary for Sport, Teodoro Lonferini, called the ASC's stance "inappropriate" but echoed Crescentini's confidence that the situation would be resolved before the match on 27/3/14. If the situation is not resolved before the aforementioned date and San Marino are unable to fulfil the fixture in Slovenia, UEFA's Control and Disciplinary Body would most probably hurriedly convene to discuss the matter and could throw the book at the FSGC, especially if the association decides to withdraw all teams from UEFA competition. The association could risk forfeiting the point the national team gained at home to Estonia at the tail-end of last year, and under Article 27.04 of the UEFA Euro 2016 Regulations, would lose the rights to all payments due to it from UEFA. Indeed, UEFA could also fine the FSGC, request that payments made to it by them be returned and ban the Sammarinese organisation from all future competitions. That would spell disaster for football in San Marino and could set development back decades, if indeed football in UEFA's second smallest member state would ever recover. Should San Marino be banned from UEFA and FIFA competitions, certain sections of the media and football fandom, who already deride San Marino's national side as the laughing-stock of European football, would claim justification regarding their calls for the smaller countries to be excluded from UEFA and FIFA competition, saying that the FSGC is not competent enough to fielding an international team or organise its own affairs. Crescentini is correct in saying that any strike would undermine football in the republic, and also the country's image abroad in all sorts of ways. It has to be said that the timing of the strike is more than unfortunate; the ASC would have been better suited to waiting until the end of qualifying competition for Euro 2016 before calling for strike action. On the other hand, the FSGC could, and should, bend somewhat and allow player representation on its board, and also liaise with the ASC to set out a timetable for discussion and possible implementation of the grievances of the association's members. If the players do have ideas to improve and promote football in San Marino both locally and internationally, they should be listened to. Without players, there is no national governing body. As ever, though, the truth probably lies somewhere in between the positions of both the FSGC and the ASC. What is obvious, however, is the fact that both sides are taking the situation seriously and that in itself is encouraging, but they must move quickly to repair the damage caused by this historic, though unwanted, scenario which is now facing football in San Marino. The reputation and future of football in San Marino could be at stake, and no-one with the interests of football in the country at heart, both within and without the state, would want to see either damaged. AUTHOR'S NOTE: The information contained above was gathered from the RTV San Marino, Corriere Romagna and La Repubblica websites, amongst others. As per usual, any errors, either in translation or the content itself, are the author's own; corrections will gladly be made upon notification. 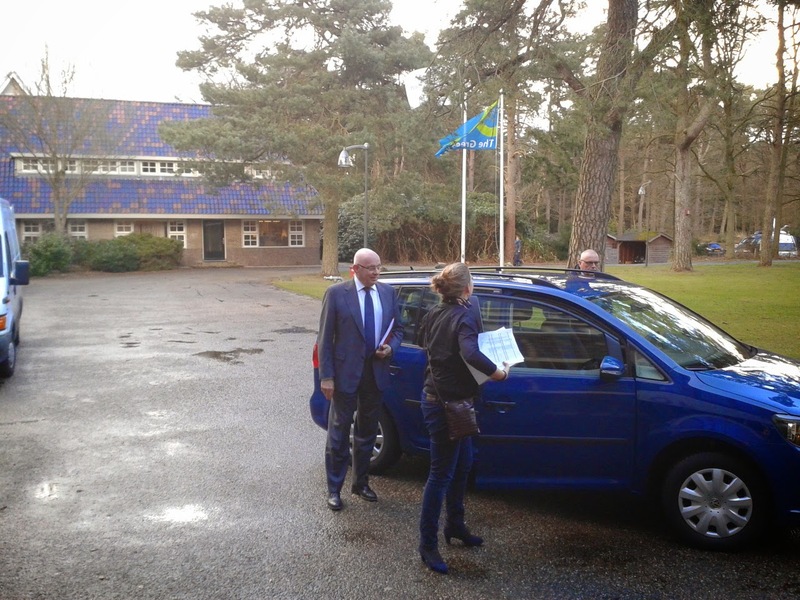 KNVB chairman Michael van Praag laid out his manifesto for the forthcoming FIFA presidential election at an extraordinary general meeting of the Dutch FA in Zeist on 2/3/15. Two of the other three candidates - Jordan's Prince Ali Bin-Hussein and former Portuguese international Luis Figo - have already stated their cases. Only Sepp Blatter, the incumbent holder of football's top job, has yet to inform the football world of his plans, and quite possibly does not feel the need to do so. Van Praag's manifesto was not quite the only item on the agenda; the KNVB provided details of their progress in building their new KNVB Campus, which will service the training needs of every Dutch national side up to U-21 and women's national team level. The new facility, which should be completed in mid-2016, will also be used to train referees; the federation's new offices and a hotel are also to be situated on-site. The meeting also covered a vote ratifying van Praag's candidacy and the KNVB's covering of the costs involved. The meeting was brought forward some three hours ahead of schedule in order to facilitate van Praag's early departure for Ascunción, Paraguay, to attend the COMNEBÓL congress; as a result, the scheduled press conference was cancelled, thus denying the assembled press the opportunity to question the KNVB chief on his manifesto. His trip to Paraguay was his first real chance to "press the flesh"; on 29/1/15, the day of his candidacy announcement, he already had the support of the five national associations needed to mount his campaign. Apart from the KNVB, of course, the SFA and the governing bodies representing football in Belgium, Romania and the Faroe Islands had already provided written guarantees of their support, which were delivered to FIFA HQ in Zürich the day before his announcement. The manifesto itself contained much food for thought, and van Praag began by announcing that his campaign would be carried out under the title "Football For Everyone." He mentioned that the KNVB were the first football association to fully recognise the rights of the LGBT community (that will most probably be enough to cost him the vote of the Russian FA), and also that they were one of the first to combat racism and sexism in football). He stated that, should he be voted in as the next FIFA president, that costs would be brought down to an acceptable level and that profligate projects such as the promotional film that was brought out last year at a cost of some €20000000 would become a thing of the past. The financial gap between the richest and the poorest countries was growing annually, he said, and this would have to stop. During his announcing of his candidacy on 29/1/14, van Praag promised that he would only serve one term as FIFA president should he be elected, and that he repeated that promise at the congress, adding that he would sign a promise to do so should that be required. He also said that it was the duty of his generation to leave FIFA in a better state for the next generation. A world trainers' academy would be introduced, where there would be a guaranteed transfer of knowledge and that there would be a discussion as to which training methods were the best and that these would be implemented. Similarly, a central referee's academy would be created in order to avoid confusion and conflict among referees with regard to decisions. There would be more room for modern technology in football; van Praag conceded that it would be impossible to implement the use of video technology everywhere, but that it would be used wherever possible. Why, he asked, should the referee be the only person in the entire stadium without access to a replay of a controversial decision during a match when those watching can call up a replay in seconds (unless, of course, they are spending the entire match taking selfies - it might be an idea to request a ban on selfie sticks in stadia)? The creation of FIFA regional embassies was mooted; there would be at least one per confederation, and their function would be to liaise with football associations which fall under the umbrella of a particular confederation. A Presidents' Board would also be set up; this would involve the heads of the six confederations in decision-making and "give FIFA some of its structure back." Van Praag was of the opinion that most countries never get the chance to qualify for a major tournament; so, a proposal to increase in the number of countries participating at a World Cup final tournament from 32 countries to 40 was announced, with every one of the 6 confederations receiving an extra place, and that the (co-)hosts, and also the winners of the previous tournament, would also receive a guaranteed place. Should the situation arise where there would only be one host country, this would leave one place free; this would be filled by organising a play-off series. The above proposal to ensure that each continental governing body would receive an extra place at a World Cup Finals might well be enough to swing the votes of every country in Oceania van Praag's way; after all, itremains the only confederation without an automatic qualifier for the World Cup Finals. The OFC member states might also benefit from another of van Praag's proposals; he suggested that the annual donation to each FIFA member association would increase from $US 250000 per year to $US1000000. A budget - in addition to FIFA's GOAL project - would be made available for member countries to improve their football infrastructures where needed. More prize-money would be made available to World Cup and Confederations Cup qualifiers, but costs would be kept down as FIFA would arrange accommodation for the teams. There would be better insurance for players at World Cup tournaments, but also for those taking part in U-20 and U-18 tournaments and qualifiers. Van Praag also touched on the need to bring the Garcia Report into the public domain, as FIFA should behave in a normal, decent fashion and be transparent in all facets of its operation. All decisions taken by the ExCo (FIFA's Executive Committee) He would also lay his, and all of the organisation's accounts, open for inspection per proper international accounting standards. Van Praag concluded by saying that every campaign needs financing, but "if the underdog scores one more goal than the favourite, they've won the match." There then followed an opportunity for delegates to provide their opinions on van Praag's candidacy, and one of the main officials in the amateur branch of the KNVB stated his opposition to the candidacy, saying that there was much to discuss as that there had been problems in the amateur section due to 50 of its members losing their jobs in the last year due to cost-cutting within the KNVB (the overall total of jobs lost came to around 70), and asked why should the KNVB now spend €400000 on a FIFA presidential campaign? He added that this will cost amateur football a lot, and enquired as to whom would foot the bill for the campaign should the present assembly refuse to endorse van Praag's candidacy. 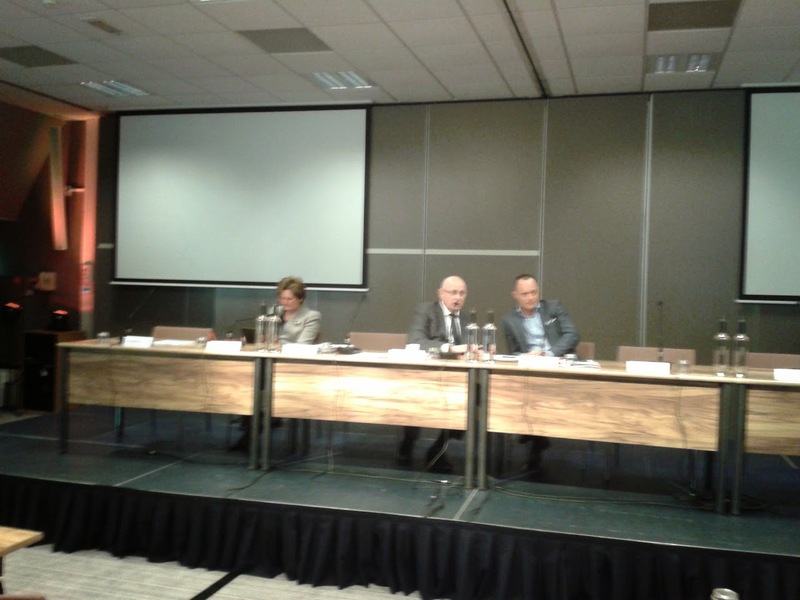 One of the platform informed the delegates that van Praag, like everyone else in the room, was a volunteer within the KNVB, but would underwrite the entire cost of the campaign himself should the congress refuse to endorse his candidacy for the FIFA hot-seat and also refuse to ratify the KNVB covering the costs of the campaign. Van Praag added that one-to-one discussions were already underway with various European individuals regarding his campaign, and that a report would be issued every fortnight which would inform its readers about costs incurred during that period and any other developments regarding his campaign. Another delegate asked whether there was an agreement between the three challengers to Blatter's reign; a response came from the platform that there were no such agreements, but if the three of them were to come to any agreement, this would not be made public. Before the delegates voted on endorsing van Praag's campaign and the ratification of providing the aforementioned costs, van Praag thanked those present and those who voiced their opinions and said that the "other candidates will not be holding meetings such as this one today." Van Praag's candidacy and the accompanying costs were approved by an overwhelming majority, but not quite unanimously; out of the 48 votes cast (including via proxy), four delegates voted against whilst one abstained. 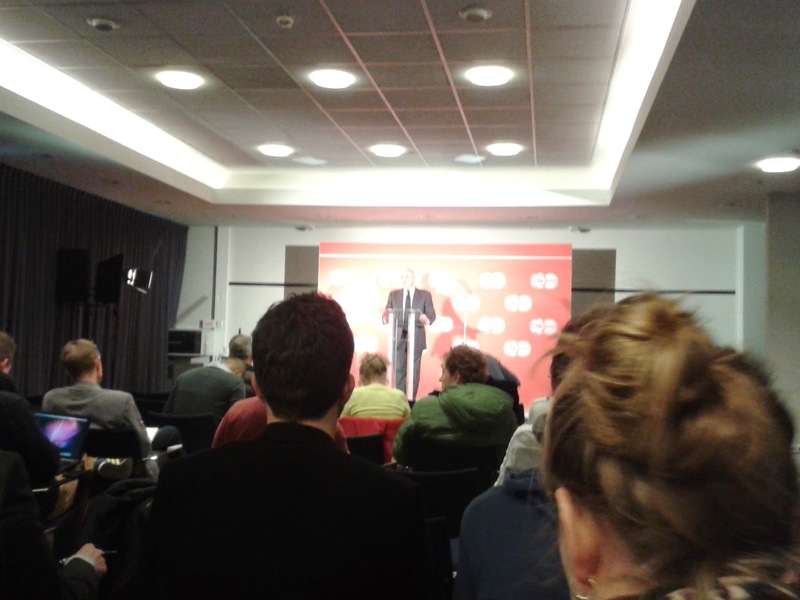 There was no further business on the agenda, so it was off downstairs to listen to van Praag deliver his manifesto speech in English before he was hurried out of the press-room and off to Schiphol Airport for his flight to South America. Michael van Praag's speech shall appear here in full shortly. AUTHOR'S NOTE: Sincere thanks are due to Marushka van Soest from the KNVB for her assistance with regard to attending the above meeting and statement to the press. Any errors can be attributed to mistranslation. Questions have been forwarded to the KNVB and Michael van Praag's team regarding his candidacy and opinions on a number of subjects, as well as to those in charge of the campaigns by Luis Figo and Prince Ali Bin-Hussein and to FIFA for president Sepp Blatter's thoughts. 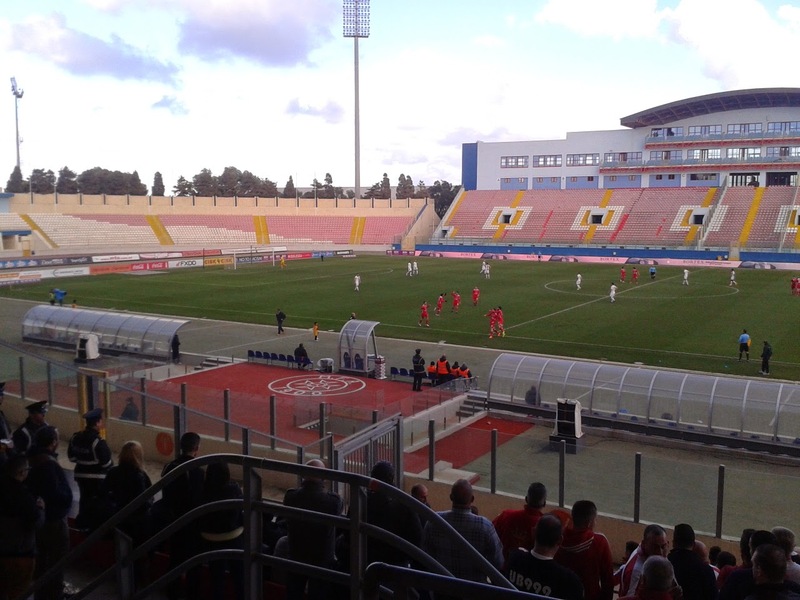 The BOV Premier League match between Balzan and Valletta at the National Stadium (Ta'Qali) on 1/2/15 was the second in a double-header which took place on that date, the first being a 1:1 draw between Sliema Wanderers and Birkirkara. The former is also the last to be featured in a series of match-reports covering games in three of the four divisions in the Maltese league system. 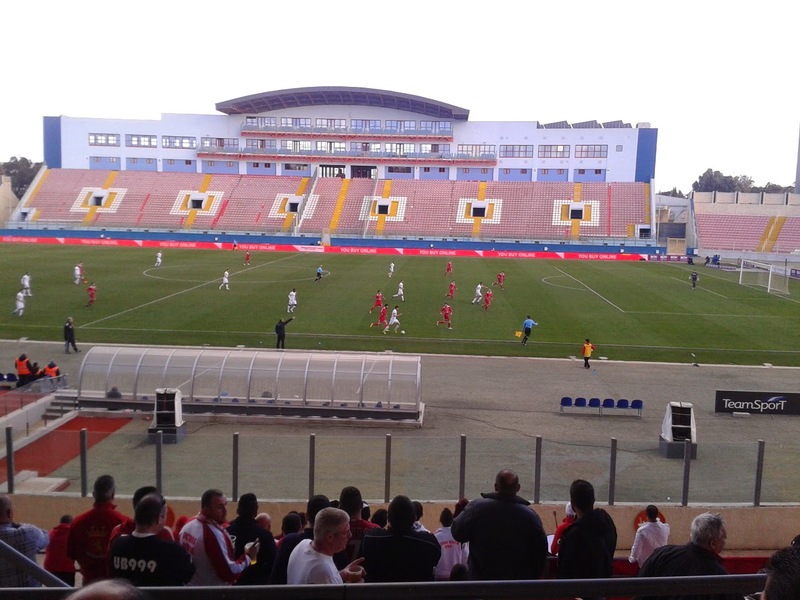 The match between Valletta and Balzan promised much as it was as much a meeting between old and new as it was about the points; the Lilywhites quite possibly have the biggest trophy cabinet in Maltese football, whilst Balzan's rise over the past few years has been partly due to money being pumped into the club by Australian-based honorary president Anton Tagliaferro. 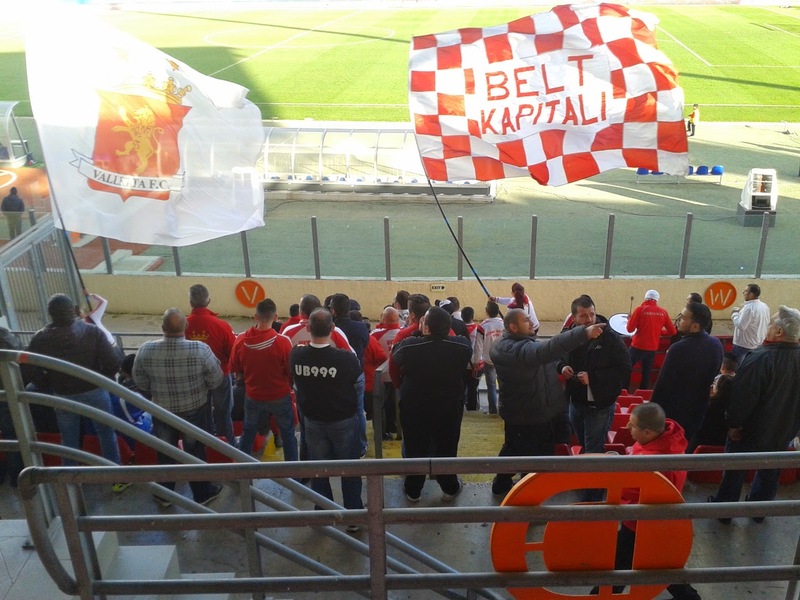 Valletta were 13 points behind runaway leaders Hibernians at kick-off, and their fans were hopeful of their heroes reducing the deficit in significant fashion, having watched - and cheered - as Birkirkara dropped two points against Sliema Wanderers in the afternoon's first game. Balzan were sitting comfortably in fourth place and a win against the champions would come in very handy as the regular season neared its conclusion. Valletta were dominant during the early stages of the game, playing a patient possession game which didn't really trouble a resolute-looking Balzan defence, who were extremely happy to soak up the early pressure and who were more than ready to send their team-mates forward at every opportunity. With nine minutes gone, a long ball out of the Balzan defence found Bojan Kaljevic all alone on the right-hand side deep inside Valletta territory with only Valletta 'keeper Nicky Vella between him and putting his team in front. Vella dashed at least 20 yards out of his area in an attempt to block Kaljevic, but it was in vain; Kaljevic simply hoofed the ball powerfully over Vella and - accurately - into the top far corner of the net. 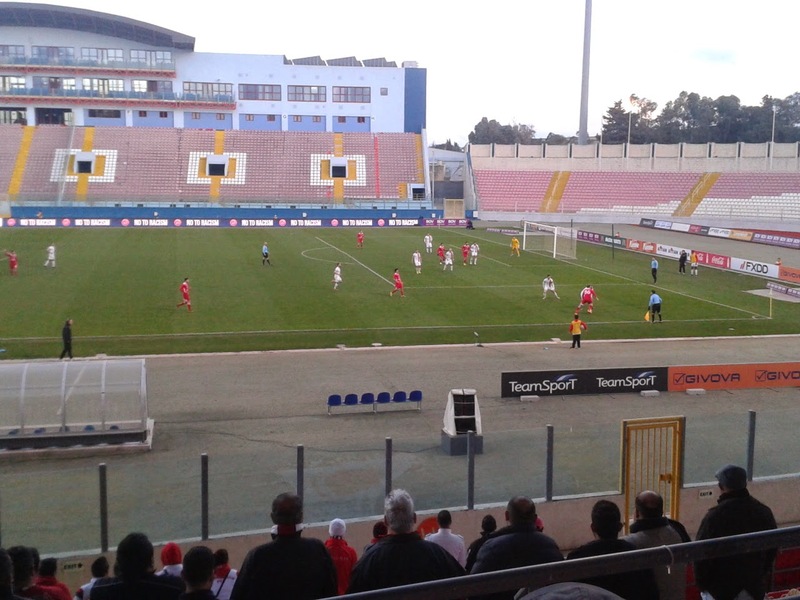 The goal stunned both the Valletta players and their supporters, who fell increasingly silent in the period following the goal, although Ryan Fenech helped them find their voice again in the 16th minute following a patient build-up and his run through the middle of the Balzan defence, which was followed by a shot from 20 yards which was just wide of Steve Sultana's right-hand post. Roderick Briffa did exactly the same thing a minute later, but his shot had the same result as Fenech's from a similar distance moments earlier: it flew just wide of Sultana's right-hand post. 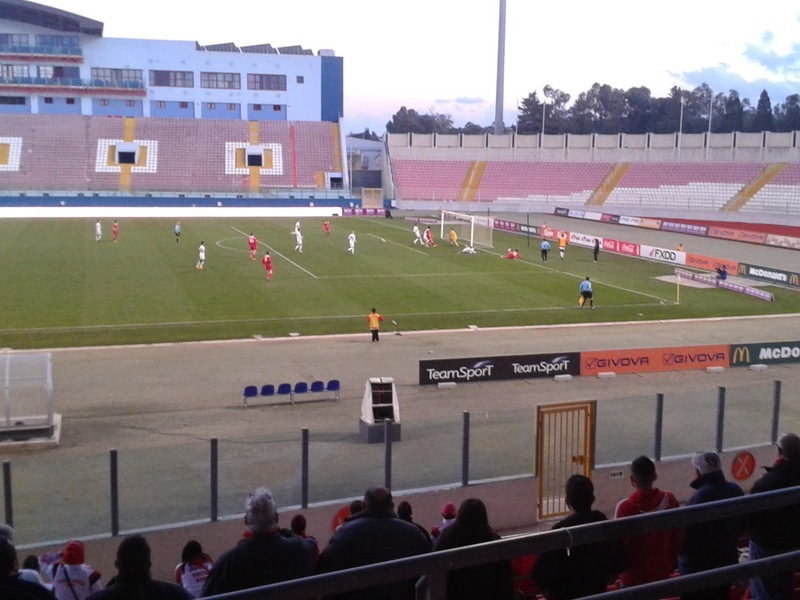 The Valletta pressure on the Balzan defence continued, but goal attempts were few and far between. Then, on 26 minutes, Fenech breezed past Samir Arab and nutmegged Terence Agius on the edge of the Balzan box before running on to confidently put the ball through Sultana's legs to equalise and to breathe new life into the encounter - and the Valletta support. However, Balzan were not about to lie down and continued to resist the white tide with no little success. They were also able to mount sporadic attacks of their own. Seven minutes were left in the first half when Kaljevic found Dylan Grima on the left-hand side, who delivered a cross that was dealt with by Jonathan Caruana, only for the ball to go directly to Gianmarco Piccioni; Piccioni's volley, however, cleared Vella's crossbar by a distance. Fenech had another crack at goal, but his shot from 25 yards went a long, long way wide. Valletta's new signing, Dutch forward Djamel Leeflang, was substituted by Shaun Bajada with half-time looming as manager Gilbert Agius attempted to put more impetus into his team, who were playing with a certain listlessness, an apathy even. Balzan's Edison Zarate delivered the first shot of the second half three minutes in, but his drop-kick from 20 yards out fizzed wide of the left-hand post. A minute later, Zarate's team-mate Kaljevic was the victim of a foul on the near touchline by Ian Azzopardi, who was booked for his mistimed challenge. A good Balzan move a few minutes later ended with Kaljevic's shot from just over 20 yards out going harmlessly wide to Vella's left. Abdelkarim Nafti tried his luck from distance as Valletta attempted to stamp their authority on the game, but it was yet another shot which failed miserably to find the target. Llewelyn Cremona was then taken off and replaced by Lateef Elford-Alliyu in the hope that the former Tranmere Rovers loanee and Bury first-teamer could repeat his double strike against Naxxar Lions from the previous match. Fenech had another shot on goal from outside the penalty-area; he appeared to be in an offside position when the ball was played through to him, but it mattered not as his daisy-cutter was saved by Sultana. A spell of play in and around the Valletta goal eventually saw Kaljevic booked on the hour for impeding Vella after a corner-kick; play then switched to the Balzan half once again where Nafti's pass down the left-hand side reached Elford-Alliyu who raced past a defender and delivered a cross-shot that was put behind for a corner. Samir Arab was the target for a Balzan counter-attack which heralded the start of another period when the underdogs were on top; unfortunately, he put the ball over the bar. Kaljevic then attempted to combine with Oscar Guerrero but was unable to reach the latter's cross and the ball was cleared. Justin Grioli was the next Balzan player to have a go, but his shot across goal from the right was high though not far wide. Dylan Grima was the intended target of a low cross from Terence Agius, but couldn't quite connect with the ball and the danger was cleared, though not before there were appeals for a penalty against Citizens defender Ryan Camilleri which were dismissed by the referee. Nafti, who had had a bit of an off-day, was subbed by Ikenna Hilary with 17 minutes left, and he hardly had time to sit down on the Valetta bench before their opponents went in front, and what a goal it was, too. Gianmarco Piccioni received the ball with his back to Vella's goal, turned and, from a distance of some 25 yards out, unleashed a viciously swerving and dipping volley which looped over the completely bamboozled Vella and flew into the Valletta net. It seemed as though the entire crowd were stunned by Piccioni's strike, though this changed as the Italian ran to celebrate his goal right in front of the Valletta fans, who reacted furiously enough to the provocation for the police to intervene as some of the supporters attempted to scale the perimeter fence. Piccioni, like Valletta's Ryan Fenech in the first half, received a yellow card for his exuberance. A sense of urgency gripped Valletta, and Fenech, who had essentially been at the hub of everything his team attempted to create right from the word go, had a header saved by Sultana with just under 15 minutes left to play. Elford-Alliyu had been buzzing around since his introduction, and he beat Sultana with a shot with 10 minutes to go, but the linesman already had his flag in the air as Elford-Alliyu had been in an offside position as he received the through-ball. Valletta were becoming increasingly desperate and careless, and Balzan were constantly on the lookout for the opportunity to capitalise on any errors, though Fenech was unlucky not to level things up in the 83rd minute when his shot from just outside the error almost broke the crossbar in two; Hillary was unable to turn in the rebound and the ball was cleared. Dylan Grima, who had played well in Balzan's defence throughout the match, was replaced by Lydon Micallef with five minutes to go, before Piccioni had the chance to make the game safe thanks to good work from Kaljevic and Oscar Guerrero who were on counter-attacking duties, but he delayed shooting after Kaljevic's pass and lost the ball. Luke Dimech was yellow-carded for a crude challenge on Kaljevic as the second half inched towards injury-time, and this was quickly followed by Piccioni being substituted by Ryan Darmanin. Elford-Alliyu had a rather scuffed attempt on the Balzan goal blocked by Elkin Serrano who had been something of an unsung hero throughout the match, getting on with the job and not being terribly fussy about how he went about it. Guerrero was taken off in the second of four minutes of injury-time and replaced by Ryan Darmanin, but not before he shot wide from inside the penalty-area at the end of a counter-attack, stumbling as he did so. Shaun Bajada had a cross-shot palmed away by Sultana, and the last few moments featured some harum-scarum football from both sides, before the referee put Valletta out of their misery. Balzan had taken the points, but they had hardly been stolen from Valletta, who, despite having the majority of the possession and for all Fenech's efforts, simply did not seem to know what to do with the ball when they had it, or seemed too afraid to have a shot at goal. Apart from Fenech, Ryan Camilleri was solid in defence and Hamza Barry and Nafti impressed. Balzan came with a game-plan, which seemed to be to frustrate Valletta and rely on counter-attacks, and the game-plan worked an absolute treat. Compliments go to the defence in its entirety, and to Kaljevic and Guerrero for their toiling upfront. The celebrations were long and loud amongst the knot of Balzan fans in the far upper corner of the stand and their charges on the field, and deservedly so. Anton Tagliaferro's approach of strengthening the Balzan squad at every opportunity might not be to everyone's taste, but, bit by bit, it seems to be paying dividends. 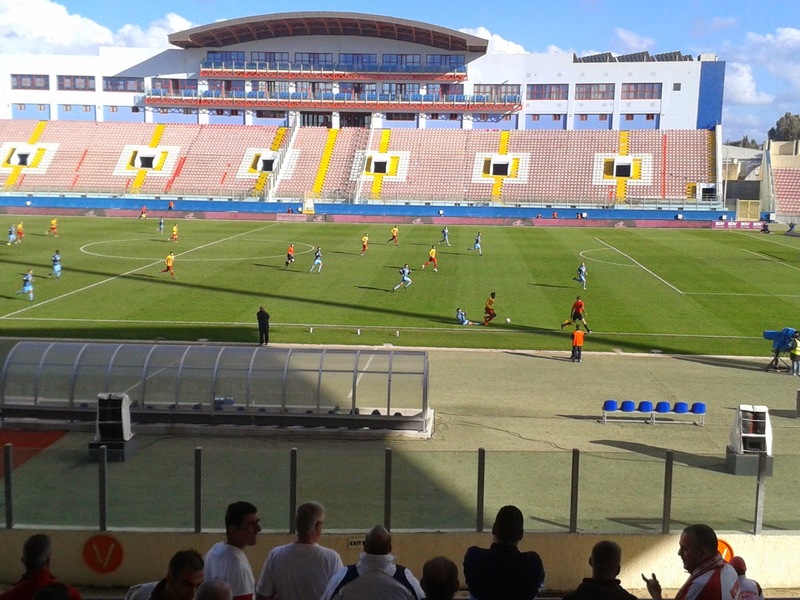 Could they become the next Birkirkara? Time will tell, of course, but this result virtually assures them of a top four finish at the end of the regular season, and leaves them handily-placed for a tilt at a top-three finish in the championship phase. UPDATE: Both teams have played three matches since the above fixture, and both Balzan and Valletta have won one, drawn one and lost one. At the time of writing, with the points gained during the regular season being halved as the season has moved into what the MFA calls "Phase 2", Hibernians remain unbeaten and now have an 8-point advantage over Birkirkara, with Valletta now three points behind the Stripes on 25 points. Balzan are in fourth, ahead of Floriana on goal difference. Sliema Wanderers occupy sixth place on 18 points, four ahead of Mosta Gunners; Pietà Hotspurs are ahead on Zebbug Rangers on goal difference in eighth. Naxxar Lions are tenth on 11 points, ahead of Tarxien Rainbows on goal difference. Qormi are propping up the table on 9 points. AUTHOR'S NOTE: Thanks as always go the MFA matchday squad (and Gerry in particular); The Times of Malta and the Malta Football website were used to compare and confirm notes. As ever, any errors/omissions are the author's own. 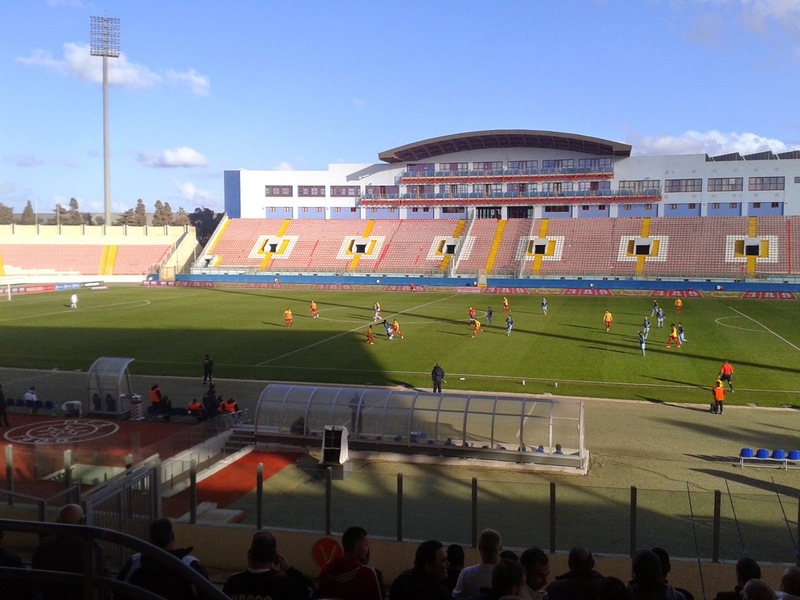 The final double-header of this series of match reports, covering football matches - in various divisions of the Maltese league set-up - which were played during late January and early February, took place at the Ta'Qali Stadium on 1/2/15, with the first match featuring BOV Premier League rivals Sliema Wanderers and Birkirkara. Third-placed Birkirkara went into their match with mid-table Sliema Wanderers on 1/2/15 expecting to come away with nothing less than three points; the Stripes were some fifteen points behind rampant pace-setters Hibernians, who had drawn 1:1 with Mosta Gunners the day before. Sliema, on the other hand, were in seventh at the start of proceedings and had earned just the one point from their previous three games, having thrown a 3:1 lead away against Balzan in their last fixture to lose 5:3. Sliema had the better of things during the first few minutes, but Birkirkara's Eliandro Dos Santos almost capitalised on a Blues defender failing to pick up a loose ball after five minutes and ran through a huge gap in the Sliema defence, but his shot was saved by 'keeper Glenn Sammit who had advanced to just past the penalty-spot. A minute later, Eliandro almost fashioned another chance for himself when he went on a run down the left, but he was denied by Joseph Borg's timely interception at the angle of the six-yard box. Djumo Bocar slid the ball forward in midfield to Borg two minutes later, but the latter's shot from some 30 yards out was of the weak variety and easy for the man who was formerly Malta's first-choice goalie. The game's first yellow-card came in the ninth minute, when Birkirkara's Nikola Vukanac found himself in the book after a foul on Bocar. In the 10th minute, Birkirkara had two attempts to take the lead foiled within a few seconds of each other. Sammit superbly stopped Eliandro's point-blank shot from the left, only to see the rebound come to Rafael Ledesma just outside the six-yard box; the Brazilian tamely shot at goal, and his effort was cleared off the line by Stefano Bianciardi. Filipo Talato and Trevor Cilia had chances for Sliema; the former was able to run through on the left of the Stripes' box but Haber was out in smart fashion to collect, whilst Cilia turned and shot from 15 yards out, but his half-volley was well wide of the mark. Bocar then played a dangerous ball into the box, but there were too few blue shirts in support and Ryan Camenzuli headed clear. Birkirkara stepped things up a notch, and took the lead after 19 minutes. Eliandro marauded down the right before passing to Gareth Sciberras, who crossed and found Ledesma, unmarked and six yards out to the left of goal, who headed past Zammit. It was all too easy: where was the Sliema defence? It was all Birkirkara for the next ten minutes or so, with Eliandro's curling shot deflecting off a defender for a corner after 21 minutes, which was quickly followed by a dangerous Paul Fenech run on the left being ended by a last-ditch tackle from Alex Muscat. There was a curious yellow card for Sliema's Trevor Cilia in the 28th minute; Luxembourger referee Kopriwa appeared to book him for time-wasting at a free-kick. Anyway, Cilia took the kick which came to Borg, but his hook-shot was easy meat for Haber. Two minutes elapsed before Scicluna was the recipient of a ball played across the Sliema area to feet on the left; he ghosted past Muscat only to shoot wide from five yards out. Scicluna was booked for a foul on Beppe Muscat when attempting to curtail a Sliema counter-attack, and joining him in Kopriwa's little black book moments later was Borg, carded for a challenge on Camenzuli which was a fair one to everyone else in the stadium. Muscat was not having his best game in the Sliema colours, and he and John Mintoff were guilty of a lapse in concentration a minute before half-time when they allowed Eliandro to glide between them on the left-hand side of the area and deliver a header from eight yards out, but fortunately for the Blues duo, the header was weak and bounced into Zammit's hands. There was still time for Bocar to try his luck at the other end, but the ball flew over Haber's crossbar. Haber and Bocar were booked on half-time for protesting, while, unseen by all and sundry, Paul Fenech appeared to put his head into Mintoff's face; Mintoff had been stirring things up a little, but didn't make a meal of Fenech's unwanted greeting. The Stripes began the second half on the front foot, with Fenech's free-kick four minutes after the restart being saved by Zammit at the second attempt, before yet another last-ditch tackle, this time from Bianciardi, Sliema's best defender in the first-half, who denied Scicluna six yards out from an open goal on the right. Birkirkara were doing most of the pressing at this stage, with Scicluna and Shola Haruna providing dangerous crosses time and again from either side of the Wanderers defence, who were playing dangerously deep within their own half of the field. A hugely ineffective Mintoff's suffering was ended when he was substituted by Peter Xuereb, whilst Scicluna was taken off and replaced by Edmond Agius; between the substitutions, Scicluna's team-mate Edward Herrera was booked for a late tackle on Cilia. A Haruna handball on 69 minutes was missed by the ref; the Birkirkara man's pass to Eliandro was followed by a low cross from the left which was fumbled at ground-level by Zammit. The ball fell to Camenzuli six yards out who swept it into the net; Birkirkara thought they had doubled their lead, but, luckily for Sliema, the linesman had already flagged for offside. Blues' manager Stephen Azzopardi immediately substituted Filipo Talato with Andrea Pisanu. Another case of dithering within the Sliema defence was almost punished in the 72nd minute after a Ledesma ball from the right-hand side was picked up by Agius, who had skipped through the defence and struck from 10 yards out; it was another lucky escape for those in front of Zammit as the ball cannoned off the top of the bar. Birkirkara were utterly dominant now, and even though Sliema were showing slightly more attacking promise, their defence was vulnerable and extremely hesitant. The Blues' attacks were hampered by poor final balls or too little support from midfield. A good display from Eliandro ended suddenly with less than a quarter of an hour left when he pulled up clutching his hamstring. He was replaced by Kurt Zammit. Beppe Muscat quickly followed him; the Blues man was subbed by Axl Xuereb. Ten minutes were left on the clock when Ledesma found Agius with an accurate pass; the pass may have been accurate but Agius was marginally offside when the ball was played. The linesman did not pick up on this, though, and the substitute ran on and shot, only to be denied by the woodwork for the second time in less than ten minutes. Sliema attacks had been rare throughout the second half, but there was a glimmer of a chance with three minutes to go, when a good knock down by Bocar was picked up by Cilia; this came to nothing as what appeared to be a cross between a shot and a ball over the defence was picked up with ease by Haber, who had been virtually unemployed for the entire second-half. 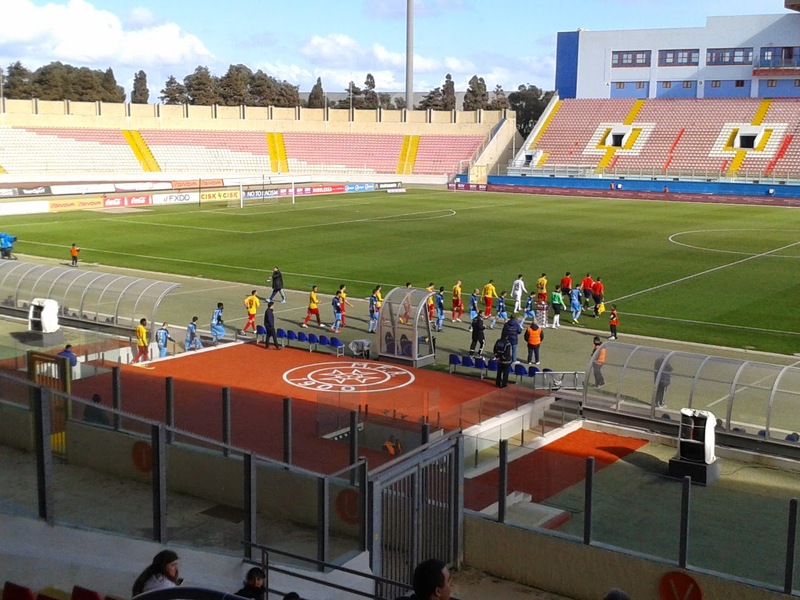 There was more injury misfortune for Birkirkara, meanwhile, when Sciberras was saddled with a knee injury which necessitated his substitution by Matheus Bissi. Just when Birkirkara thought they would be taking the points back to base with them, the unthinkable happened. Following a hopeful punt upfield from a Sliema midfielder in the 88th minute, the ball reached the edge of the Stripes' penalty-area, where Haber, team-mate Maurizio Mazzetti and Wanderers' Bocar competed for the ball. The ball came out to the onrushing Cilia, who flipped the ball off Mazzetti, over Huber and beyond the backtracking Nikola Vukanac into the empty Birkirkara net. The scenes in the Sliema enclosure were joyous in the extreme, but most of the noise did not emanate from the Blues fans; rather, the racket came in the main from the Valletta fans who were gathering to watch their fixture with Balzan which was up next. Four minutes of injury-time were played, but, as was the case during normal time in the second half, Birkirkara were unable to convert their pressure into something more tangible, and Sliema Wanderers came away with an improbable draw, much to the delight of their tiny contingent of fans. It must all have felt like dejà vu for Birkirkara's team, staff and fan base; they had conceded an injury-time equaliser against runaway leaders Hibernians the week before. Still, they were to receive some reasonably heartening news before bedtime, but that, as they say, is another story.. The injury-hit duo of Scicluna and Sciberras, together with Camenzuli, Ledesma and Haruna, were Birkirkara's finest on the day, with Bianciardi shining for the Blues, with Borg, Bocar and Zammit all more than doing their bit to keep the good ship Sliema afloat. Insert your own cliché here if you will, but Sliema Wanderers' display surely proved that one good ball, followed by one good shot on goal, can be enough to garner something from a match. UPDATE: Sliema Wanderers ended up having quite a good February, and went on to win two of the other three games they played during the month, their only (other) blemish coming against Pietà Hotspurs on 28/2/15 when they conceded an equaliser in injury-time. They are currently in sixth place. 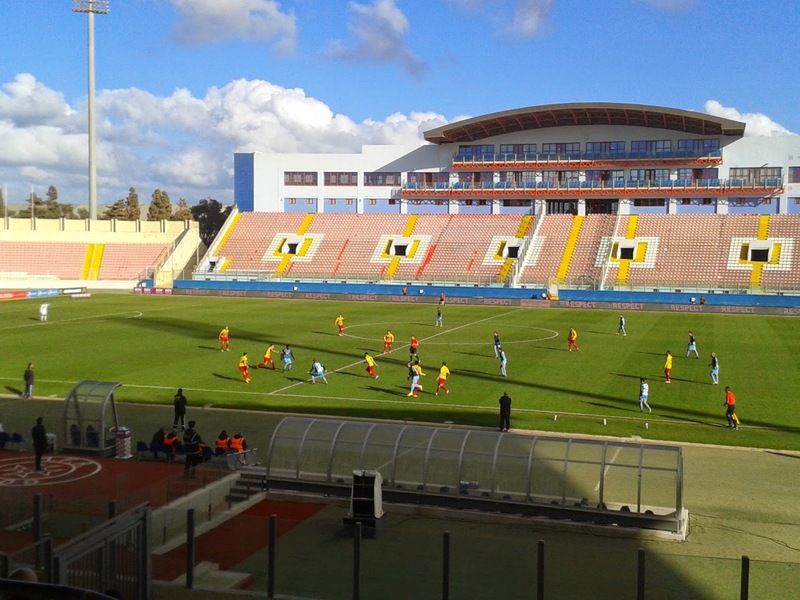 A week after they played Sliema Wanderers, Birkirkara drew 1:1 with Valletta. They won their next two games and currently remain in third place with a much-reduced deficit on leaders Hibernians. Clubs play each other three times during the season, a total of 33 games. After playing 22 matches, the points total of each club is halved and brought forward to Phase 2, where clubs play each other once. Both teams are due to play each other again on 7/3/15. AUTHOR'S NOTE: Many thanks to Gerry and the rest of the MFA matchday staff on duty at the National Stadium; the Times of Malta was used for comparison and reference.